‘Those building materials are bad! See that steel, it is very small. The bricks are also weak, they could not build a tall building like this’. On 14 June 2017 – the same day as the Grenfell Tower fire – a tower block collapsed in Kariobangi estate, Nairobi, Kenya. As with Grenfell, this tragedy did not strike from nowhere; it was rooted in social and spatial injustices of urbanisation, the volatility of construction materials, and disregard for regulations and planning, as Maria’s words imply. 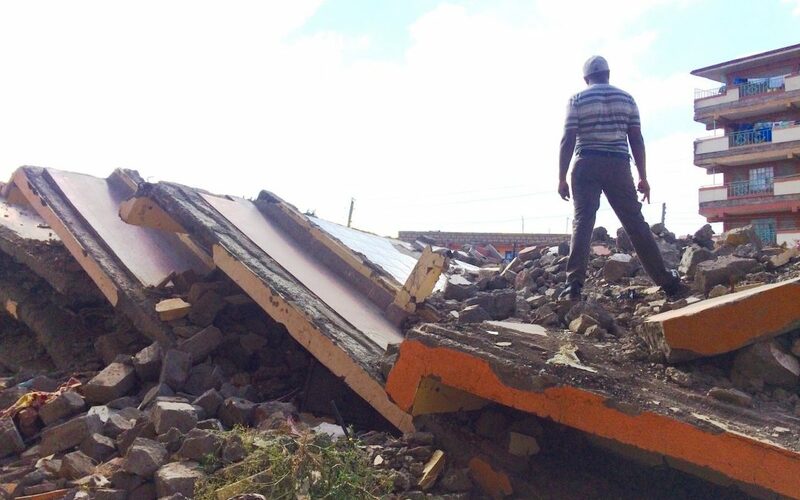 Far from being an isolated incident, in Nairobi such collapses have become shockingly frequent. The city has experienced a spate of devastating apartment block collapses in which scores of people have been killed. Between 2010 and 2016, at least twelve apartment blocks collapsed, and so far five have collapsed in 2018 alone. The ‘Collapse’ project, conducted as part of my Hallsworth Fellowship at the University of Manchester, explores this drastic landscape of architectural failure, tracing the afterlives of such events and how they are situated within the larger socio-political landscape of the city. It examines how the speed of Nairobi’s urban growth is producing a parallel threat of architectural failure, in which material and structural fragility are closely related to wider dynamics of social and economic precarity. Nairobi is one of the fastest growing cities in Africa; its population has more than doubled since the 1980s and is growing at a rate of more than 4% annually. Rapid growth combined with rising land prices has helped to generate new neighbourhoods of hurriedly constructed tenement buildings. This is particularly acute in low-income neighbourhoods, where what I term ‘grey development’ – ad hoc property speculation that is neither fully legal nor illegal – produces poor-quality tower blocks built from substandard materials, often without services or suitable foundations, and at very high densities. Life in these tenement estates is challenging – services are few and overloaded, roads are unsurfaced and there is little drainage, meaning floods and power cuts are frequent. Though largely overlooked by scholars working on Nairobi, grey development is now the dominant silhouette of Nairobi’s skyline. It forms the core of the construction industry and houses the majority of the city’s population. This is in stark contrast to the city authorities’ claims to be turning Nairobi into a ‘world class’ city of spectacular infrastructure and gleaming high rises. When grey development collapses, the disparity between these global city dreams and the everyday lives of ordinary Nairobians is materialised. 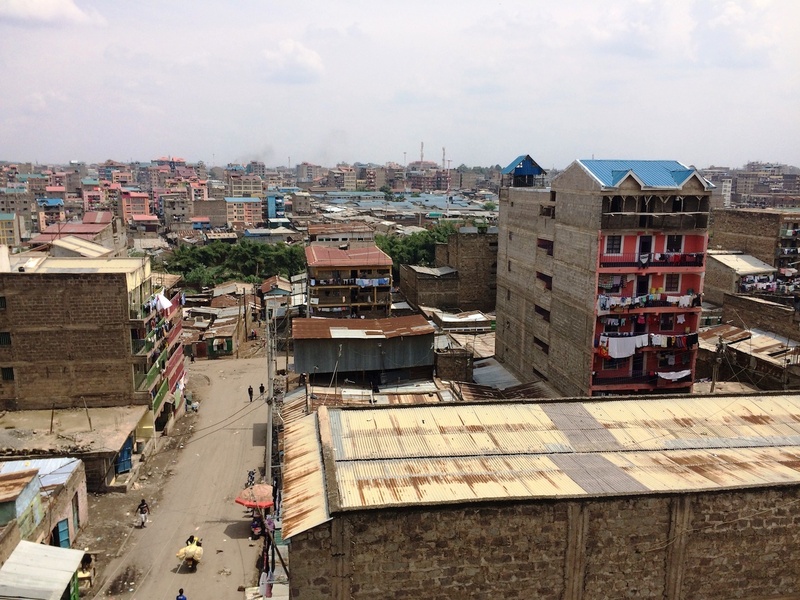 Nairobi’s unauthorised rental housing is usually a shadowy and secretive world, but collapse starts to make visible the human and non-human assemblages which constitute grey development. What is also apparent in Maria’s account is her repeated reference to sight. ‘Now you can see’ she said, as though the building itself had laid bare something of the political economy that produced it. Just as the internal structure of the building had been turned inside out, the twisted rebar and leaking pipes exposed, so too the fragility of Nairobi’s housing sector was revealed. Tower block failure thus goes beyond technical breakdown to reveal deeper concerns about the precarity of life in a fast-changing city. In this way, examining failure and its aftermath can help to trace the unmaking and remaking of the communities, processes and materials of a city. Failure events become folded in to larger narratives of inequality, urban justice and accountability. In a rapidly transforming urban landscape, Nairobi’s building collapses have become both a comment on, and a product of, the empty promises of life in a ‘world class’ city. Read Dr Constance Smith’s research here.